Star Sync can usually share the GPS receiver with other GPS software. 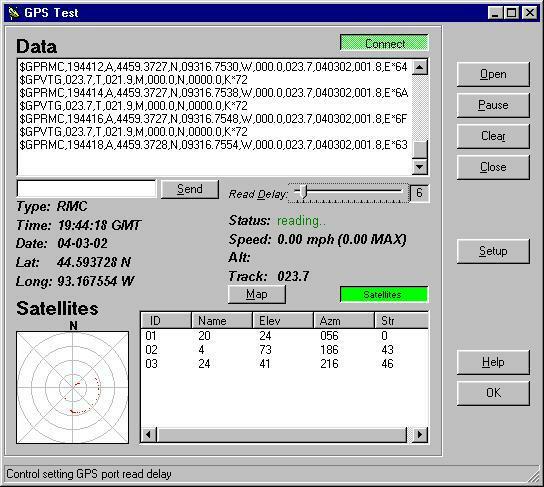 Star Sync can work with many GPS receivers that output standard NMEA strings. Star Sync can be used with RMC, GLL, GGA or ZDA NMEA type stings. For Star Sync to work you must connect the data port of the receiver to a serial port (real or virtual) on the computer. Consult the documentation on how to turn on the NMEA output stream. Most receivers enable the output but default. Many NMEA devices default to 4800 baud. Install the Star Sync software from the CD-ROM or download the software from the web site. 1) Select the 'Garmin 35PC' Model and press 'Reset'. 2) Select the number of the COM port where the receiver is installed. It is recommended that you then try the default settings in the GPS Test screen. Baud rate: Adjust the baud rate if not 4800 baud. Port Parameters: The port settings are set to '8-1-none' (data bits -stop bits - parity) if your receiver is different contact Beagle Software for instructions on how to adjust the software. Handshaking refers to the internal communications protocol implemented in the computer hardware by which data is transferred from the communications port to the GPS. For most installations the default settings are adequate. Tip: First try opening the port without any handshaking settings. DSR pulse: Determines whether to have Star Sync wait for a pulse on the DSR line before making a time fix. Such pulse per second outputs are options on some GPS receivers such as the Garmin 35-LVS. This feature requires a custom interface cable between the GPS and PC. Contact Beagle Software for more information. DTR Enable: Determines whether to enable the Data Terminal Ready (DTR) line during communications. Typically, the Data Terminal Ready signal is sent by a computer to the GPS to indicate that the computer is ready to accept incoming transmission. RTS: RTS/CTS (Request To Send/Clear To Send) handshaking. NMEA Time Type: NMEA message type containing time. This is the identifier that Star Sync uses to find the NMEA string that contains the time. Minimum Time change: Enter the number of milliseconds for the smallest time change the clock will be set for. This value should be set slightly above the accuracy of the GPS receiver. Set the value high enough so that the clock will not be changed constantly by a small value. Initialization Strings: the initialization strings are optional strings that are sent to the GPS each time ClockWatch starts and before the first time setting is made. 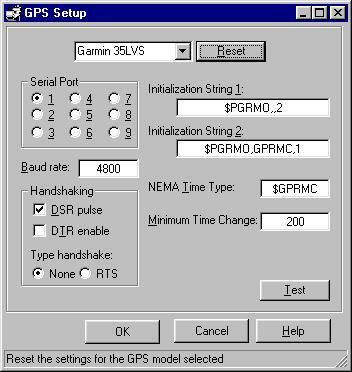 The strings can be used to configure the GPS or modify the NMEA strings that are outputted by the receiver. Both strings are optional. 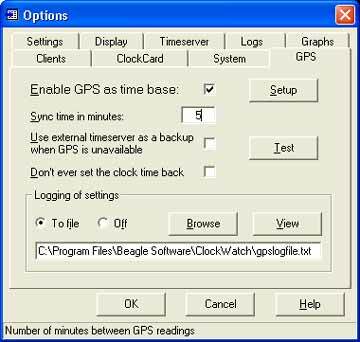 Set Star Sync to use the GPS receiver by Enable GPS as time source (Optio ns->GPS). Set the interval (in minutes) how often Star Sync will check time. Close the Options, Setup and Test screens. After Star Sync verifies that the computer has been synchronized the ClockWatch Service can be started and run to keep the computer synchronized. This service runs whenever the computer is on and the Star Sync application need only be run to change settings. For more information on Star Sync, please complete the information request form. Or call us toll-free at 1-877-845-2549.